Tissue Engineering Made Easy provides concise, easy to understand, up-to-date information about the most important topics in tissue engineering. These include background and basic principles, clinical applications for a variety of organs (skin, nerves, eye, heart, lungs and bones), and the future of the field. The descriptions and explanations of each topic are such that those who have not had any exposure to the principles and practice of tissue engineering will be able to understand them, and the volume will serve as a source for self-teaching to get readers to a point where they can effectively engage with active researchers. Medical students, Bachelor of Science students, PhD students in tissue engineering and stem cells, surgeons, plastic surgeons, physicians, pharmaceutical companies, public with an interest in applications of TE to cure diseases. Chapter 1. What is Tissue Engineering? His status as an early-career researcher (with a limited publication record; h-index 5) is precisely what makes this author the ideal voice for a truly entry-level volume. Other successful Life Science titles – MATLAB for Neuroscientists and Guide to Research Techniques for Neuroscientists – serve as examples of how young authors can effectively address the questions most pertinent to others in their same career phase. 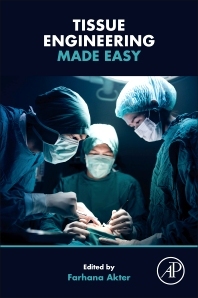 Author, OSCE Passcards for Medical Students (Radcliffe Publishing, 2014, 9781910227251) – publication designed to test Objective Structured Clinical Examination candidates on procedure for a wide variety of topics. Presents topics in an easy-to-read format, detailing best practices, pertinent questions, tests to perform, and possible responses and suspected diagnoses. Prizes & distinctions: Great Britain & Ireland Intercalated award, 2009; Young Physiologists Prize, 2009; Royal College of Obstetrics & Gynaecology research prize, 2010; Merit prize for Teaching, 2013. Additional clinical and research experience: Critical care, MGH, Harvard Medical School; Neurosurgery, Hospital Kuala Lumpur; Postpartum Haemorrhage, BDG, Hospital, Tanzania; Febrile convulsions, ICMH, Dhaka, Bangladesh.